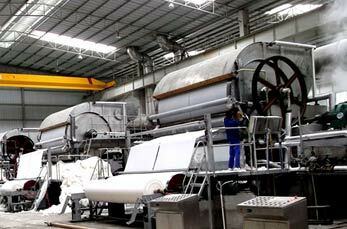 With the development of India’s economy, paper making industry in India is also showing rapid growth trend. What’s more, due to our superior quality paper production machines, our company has built good cooperation relations with a great many of Indian paper plants. This summer, the guests from India were invited to see our workshop. We must have made a deep impression that the customers were very pleased with our high quality production and good service. A few days later, we started a conversation of our toilet paper making equipment. In July, the contract on supplying high-tech toilet paper manufacture machine between Leizhan and Indian paper mill has been signed. Devices included in Leizhan 12T toilet Paper production system: mid-consistency pressure screen, high density cleaner, vertical hydrapulper etc. Pressure screen under the rotating function of drum sieve and rotating cylinder and centrifugation effect. The machine will separate the qualified pulp and non-qualified pulp. It consists of cylinder, cylinder cover, sieve drum, rotary cylinder, base and transmission parts, etc.